Welding is a career subject for thousands of people across industries that supply welding equipment, spares and consumables. The following content is suitable for operators and installers who wish to use the various featured processes, and the technical sphere of testing and formulating procedures. Whilst this paper is at an elementary level, it includes reasonable coverage of the issues to consider in refractory applications. Sufficient technical information is included for anyone contemplating a welding programme for a shut-down or installation. It will allow for awareness around planning and implementation. The correct design of refractory could stay in place or fail, depending on the weld integrity of the anchoring. Some in the industry have the idea, that a decision to weld is a simple one, and a forgone conclusion that welding is uncomplicated, and can easily achieve a desired outcome. This paper will, I hope, demonstrate that owners, designers, contractors and maintenance personnel, should be encouraged to take a strong interest in the welding of their refractory hardware. Be it loop based anchors, hexagonal mesh, stud welded anchors, rod-lok bases or any form of refractory metal. Consider for the moment, the refractory castable or even bricks, could be separated from the shell by welding failure of the anchoring. All that money and effort to get the right materials in place, destroyed by the welded link to it all, and most likely preventable. This is probably the most popular form of welding because it can be speedy and efficient. It is the process where the welding consumable is wire of diameter generally 0.9mm to 2.00mm diameter. The wire comes off a coil and is fed down the torch held by the operator, and achieves an arc to the metals to be welded, shielded by a welding gas. 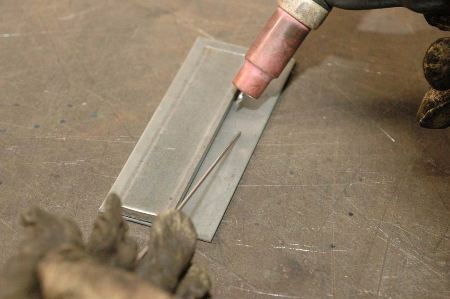 Tig welding is similar in that the weld consumable is wire, but it is hand fed into the arc and weld pool, where a tungsten electrode arcs to the metal, shielded by argon gas . 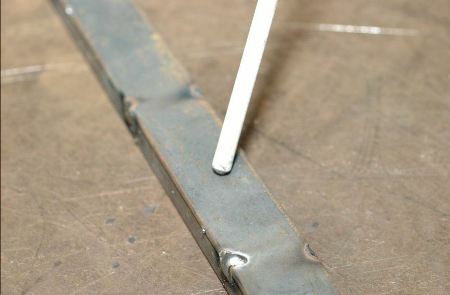 Stick Welding uses flux covered wire as the “electrode” which creates the arc and weld pool. There is no shielding gas. This type of welding relies on a high voltage/amperage power source conducted down the actual refractory stud, which forms an arc between the metal shell and the stud end, melting both sides, forming a weld pool, and simultaneously feeding the stud into the molten substrate. This all happens in a fraction of a second. There is an aluminium flux at the end of the stud, which is generally not needed for below an 8mm diameter. The amount of flux will vary. Contemplate a weld pool created and completed in a fraction of a second, where the flux ball of aluminium will melt at the base of the weld pool and instantaneously volatilise and effectively purge the weld pool of slag and impurities. It needs to be said now, that a procedure for the proposed stud welding campaign is essential. Variables include the parent metal or shell, the grade of the required stud or anchor, position and accessibility, plus a reliable steady state power source. As you can see, choosing the correct process requires some thought. You should be consider the identifying the metals that need to be welded and think about their alloying elements, such as carbon content, nickel, chromium and others. Assuming mostly stainless steel anchors, think about how will you identify them and what grade they are. Do you have traceability protocols in place? Are the anchors in containers that are inert to the stainless steel? And if so, how are the containers marked? Do you have a competent staff member who can oversee and ensure that the correct welding consumable will be used with the anchors to be welded? Is there more than one grade to be welded in different areas? There are also things to consider when it comes to the furnace shell and preparation for welding, such as shell condition, its age, identification of the shell parent metal, its general condition and its history. If it is not a new installation, how old? What was its carbon content when new? Has it been subjected to carbon deposition and absorption, from say, bunker fuel firing? Is it a chrome/moly steel? Has it been subjected to temperatures above 225 degrees celsius at any time? Was it designed to take higher temperatures for short periods, through for example, a stoppage if it is a rotating kiln? Are there any known ‘hot spots’? What does the furnace designer recommend when welding anchors for repairs and maintenance where there are temperature issues? Whether it is a new furnace or a repair, the shell at the weld area must be freshly ground to shiny metal and dust free; the anchor must also be free of dust, oil and any contaminants. As far as practicable, the atmosphere should be clear of dust as well, as safety is obviously an issue. Yes, the grinding puts particles into the air, so that air should be extracted. If the shell is made from stainless steel, it must be ground with iron free wheels. I can give you one example of the complexity you might face. There was a rotary kiln, 20 years old being re-lined. The shell material had a carbon content above normal, and over time there had been grain boundary precipitation. The owner wanted to use grade 304 stud welded anchors. This is a practice used for new kilns; I don’t ever agree with using 304 directly onto carbon steels because 304 does not have enough nickel and chrome to form a weld that is more than 40 per cent of ultimate tensile strength. Suffice to say the studs were easily being knocked off by a hammer test after welding. Most of the time you will be welding a stainless or nickel alloy refractory anchor to a carbon steel shell. There is nothing to be afraid of here! It is imperative that the correct welding consumable is used. Briefly, austenitic stainless steels such as 304, 321, 309, 310, 253 Ma, which are the most common, require that you use a 309 welding consumable. This must be Molybdenum free, to avoid embrittling phase precipitation during high temperature service. 309 welding wire often contains moly where it is to be used with marine grades such as 316. These grades are not suitable for high temperature use. If the wrong grade is used, such as 304 or 316 or 309Mo, yes you will achieve a weld, and it might even survive a hammer test. However you will have created a weld pool, that will embrittle with time, and may only be 40 per cent of the strength it should be. The technical reason for this is because of the dilution of nickel/chrome ratios in the weld pool, coming from the iron of the parent metal shell. The resultant composition will not form an austenitic structure. You must use the 309 welding consumable to get the extra Nickel/ Chrome contribution. You can use 310 grade for dissimilar welding also. 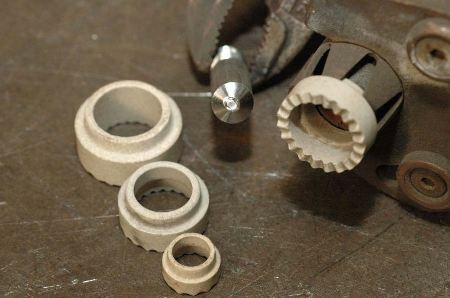 However this can result in hot-cracking of the weld bead. The reason for sometimes getting hot cracking with 310 filler metals, is because the outer cooling metal will be forming its strong austenitic structure, such, that unless the pool is kept even and flat, the outer surface cools too fast while the centre remains molten, causing a rupture. Your welder should know how to make a concave weld bead for a fillet weld, and a flatter shape for a joining weld, avoiding convexity, and a too high volume of central molten metal in the weld pool. Its metallurgy is based on 309, and has had additions of rare earth metals such as Yttrium and Lanthanum, which gives it its high temperature strength properties. Originally, when it was first made, the makers of 253Ma approved the use of 309. You can now buy the 253Ma consumable. The question in my mind, is how effectively the rare earths will transfer across the arc into the weld pool, and be evenly distributed. Probably we don’t have to worry too much about this for anchor welding, because the base of the anchor at the shell should not see temperatures above 300 deg C, at the outside. If they do, you are dealing with a hot spot, which will need your attention to lining repairs. *Please note that 253Ma is not immune to sigma phase embrittlement. With the Nickel alloys, such as 800, 600 and 601 and others, there are many charts available for the various welding consumables that can be used. Please be aware, that these alloys are readily weldable, but behave differently under the arc to austenitics, and carbon steels. They have a much increased viscosity in the weld pool, and therefore an experienced welder must be employed. * Please note incoloy 800 and Ds are immune to embrittlement. This is a vast subject. Does the welding machine have the characteristics to successfully perform the selected process? A weld procedure is required for all welding. Does it have the grunt to push power down long leads if the welding is to be done at a distance from the power source? Is the power source surge and ebb controlled? Is there monitoring equipment, e.g. tong testers to monitor current at the weld pool? Does the procedure call for this? Is there someone qualified to supervise all of this? Suffice to say, you would be wanting personnel on your site who can pass the relevant procedure qualification test, and does not present in inappropriate attire or hung-over. Whether you are dealing with a new installation, or a shut-down repair, I believe competent, independent welding inspectors are essential. The inspector must be fully informed about an applied procedure, and the interpretation of the particular code, to that procedure. This remains the province between the inspector and the welding personnel. Without upsetting production, cooperation must be established to accommodate the outcome where weld procedures can be shown to have been complied with….e.g. random printouts of different welds. I have always questioned the veracity of this crude method of testing welds. Sure if the hammer blow does not dislodge the anchor, it shows only that it has withstood a hammer blow. If there was an inclusion, or micro-crack that does not present visually, how do you know you have not just initiated propagation? Have you caused unacceptable work hardening of the weld metal by subjecting it to a stress that is compressive on one side, and tensile on the other? Maybe some random hammer testing can be a useful tool, consideration for re-welding anchors tested in this way, may be prudent. Because it is not really possible to X-Ray, Magnetic-particle test or Dye-penetrant test fillet welds around anchor bases effectively, visual inspections, and close adherence to the procedures are really the only weapons you have. Intended outcome, how will it be measured? Presumably we are aiming for 100 per cent weld integrity. I believe this is possible, if all the parameters discussed are followed, and the attitude of the welder to self quality control is always positive…e.g. is communication and goodwill between management and welding staff good enough to allow for a problem perceived or even caused by the welder to be addressed calmly? If a known problem was not addressed and corrected, later on in service, the weld could fail. Once again, the neutral welding inspector “umpire” can be invaluable as a natural mediation tool. Ambient temperature - this be a factor if the weather is cold, and the steel is in a ductile/ brittle temperature zone. The procedure may also define a minimum parent metal temperature. If there is a sensitivity here, arrangements for preheating need to be in place, including keeping consumables at recommended storage temperature, preferably in an oven if it is flux coated stick electrodes to be used. Access - Weld position will have a marked effect on weld quality. Down hand is best, where gravity assists. Problems occur with positional welding, especially overhead, where gravity tends to drop molten metal out of the weld pool, causing poor penetration, and premature cooling. No time to go into positional welding in depth. Consideration of scaffolding, manipulation/rotation of the furnace if possible can assist. Optimum welding occurs, when the molten metals in the arc pool have earth’s centre below , not to the side or above. The welders must be provided with conditions which allow them to work in safety, and not be distracted. They also need to be screened off to prevent dangerous eye flash to passing personnel. Inside a furnace, it may still be too hot to work safely in a repair situation, and the discomfort, may affect weld integrity as well. All fumes have to be extracted. Provision of breathing helmets supplied with fresh air from a human safe air source, may have to be provided. The welder must have appropriate protective clothing, as explained previously. There should be no inflammable materials in the vicinity. Plan for isolation from any x-ray activity. Ensure drinking water is readily available for the welders.